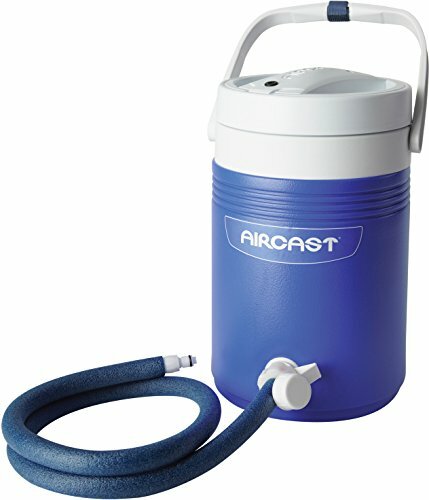 The Aircast Cryo/Cuff Gravity Cooler is an integrated approach to cold therapy that combines cold and focal compression delivered using a non-motorized, gravity-fed system. It delivers chilled water directly into a Cryo/Cuff that is anatomically designed to provide maximum cryotherapy, eliminating the risk of tissue damage. The Gravity Cooler holds water and ice needed for 6 to 8 hours of cryotherapy, and is compatible with all Cryo/Cuff and Arctic Flow pads. The Gravity Cooler includes tube assembly, plastic fittings and an insulation disk. The user manual provides easy to follow directions for use. It's ideal for minimizing hemarthrosis, swelling, managing pain, post-operative recovery, trauma, rehabilitation and sports injuries. Cryo/Cuffs and Arctic Flow pads sold separately. An integrated approach to cold therapy that provides cold and focal compression using a non-motorized, gravity-fed system. Delivers chilled water directly into a Cryo/Cuff that is anatomically designed to provide maximum cryotherapy, eliminating the risk of tissue damage. Anatomically designed Cryo/Cuff provides maximum cryotherapy, eliminating the risk of tissue damage. Ideal for minimizing hemarthrosis, swelling, and pain, post-operative recovery, trauma, rehabilitation, and sports injuries. Universal fit allows the Aircast Knee Cryo/Cuff to be worn on either the left or the right leg. 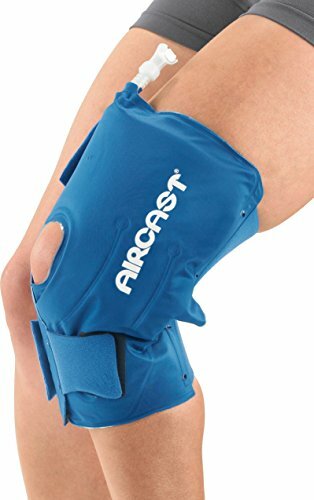 The Aircast Knee Cryo/Cuff is an integrated approach to cold therapy that combines cold and focal compression delivered using a non-motorized, gravity-fed system. Used in conjunction with the Aircast Cryo/Cuff Gravity Cooler (sold separately), it delivers chilled water directly into the anatomically designed Cryo/Cuff to provide maximum cryotherapy, eliminating the risk of tissue damage. The Gravity Cooler holds water and ice needed to provide 6 to 8 hours of cryotherapy, and is compatible with all Cryo/Cuff and Arctic Flow pads. It's ideal for minimizing hemarthrosis, swelling, managing pain, post-operative recovery, trauma, rehabilitation and sports injuries. Universal fit allows the Aircast Knee Cryo/Cuff to be worn on either the left or the right leg. 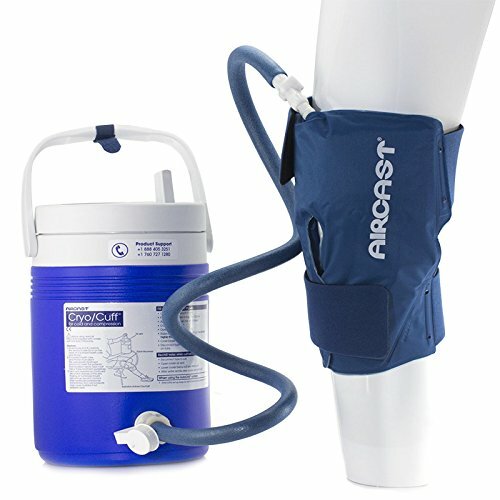 The Aircast Cryo/Cuff Replacement Insulated Tube for the Aircast Gravity Cooler is an easy and economical way to replace just the tubing for your Aircast cryotherapy system. This replacement tube assembly also includes the white plastic fittings. One fitting screws into the Aircast Cryo/Cuff Gravity Cooler and the other end connects directly to the Cryo/Cuff. Universal design allows the Aircast Cryo/Cuff Replacement Insulated Tube to be compatible with all Aircast Cryo/Cuff and Arctic Flow pads. The Aircast Back/Hip/Rib Cryo/Cuff is an integrated approach to cold therapy that combines cold and focal compression delivered using a non-motorized, gravity-fed system. Used in conjunction with the Aircast Cryo/Cuff Gravity Cooler (sold separately), it delivers chilled water directly into the anatomically designed Cryo/Cuff to provide maximum cryotherapy, eliminating the risk of tissue damage. The Gravity Cooler holds water and ice needed to provide 6 to 8 hours of cryotherapy, and is compatible with all Cryo/Cuff and Arctic Flow pads. It's ideal for minimizing hemarthrosis, swelling, managing pain, post-operative recovery, trauma, rehabilitation and sports injuries. 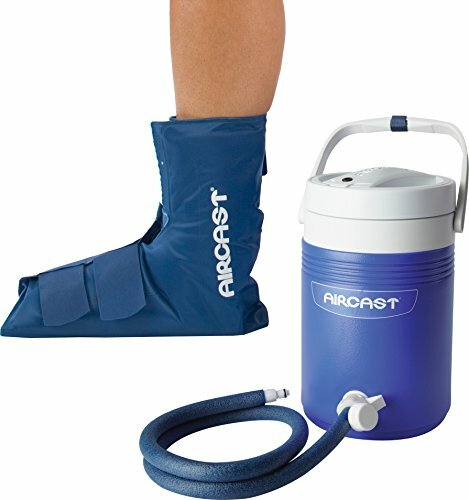 The Aircast Ankle Cryo/Cuff with Gravity Cooler is an integrated approach to cold therapy that combines cold and focal compression delivered using a non-motorized, gravity-fed system. It delivers chilled water directly into a Cryo/Cuff that is anatomically designed to provide maximum cryotherapy, eliminating the risk of tissue damage. The Gravity Cooler holds water and ice needed to provide 6 to 8 hours of cryotherapy, and is compatible with all Cryo/Cuff and Arctic Flow pads. It's ideal for minimizing hemarthrosis, swelling, managing pain, post-operative recovery, trauma, rehabilitation and sports injuries. The Gravity Cooler includes tube assembly, plastic fittings and an insulation disk. The user manual provides easy to follow directions for use. Universal fit allows the Aircast Ankle Cryo/Cuff to be worn on either the left or the right leg. 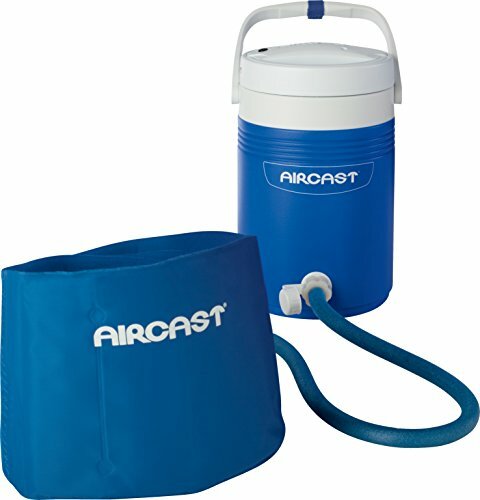 The Aircast Shoulder Cryo/Cuff with Gravity Cooler is an integrated approach to cold therapy that combines cold and focal compression delivered using a non-motorized, gravity-fed system. It delivers chilled water directly into a Cryo/Cuff that is anatomically designed to provide maximum cryotherapy, eliminating the risk of tissue damage. The Gravity Cooler holds water and ice needed to provide 6 to 8 hours of cryotherapy, and is compatible with all Cryo/Cuff and Arctic Flow pads. It's ideal for minimizing hemarthrosis, swelling, managing pain, post-operative recovery, trauma, rehabilitation and sports injuries. The Gravity Cooler includes tube assembly, plastic fittings and an insulation disk. The user manual provides easy to follow directions for use. Universal fit allows the Aircast Shoulder Cryo/Cuff to be worn on either the left or the right shoulder. 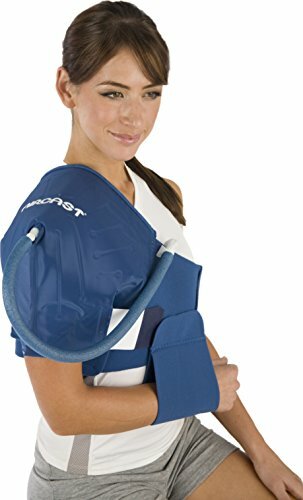 The Aircast Shoulder Cryo/Cuff is an integrated approach to cold therapy that combines cold and focal compression delivered using a non-motorized, gravity-fed system. Used in conjunction with the Aircast Cryo/Cuff Gravity Cooler (sold separately), it delivers chilled water directly into the anatomically designed Cryo/Cuff to provide maximum cryotherapy, eliminating the risk of tissue damage. The Gravity Cooler holds water and ice needed to provide 6 to 8 hours of cryotherapy, and is compatible with all Cryo/Cuff and Arctic Flow pads. It's ideal for minimizing hemarthrosis, swelling, managing pain, post-operative recovery, trauma, rehabilitation and sports injuries. Universal fit allows the Aircast Shoulder Cryo/Cuff to be worn on either the left or the right shoulder. 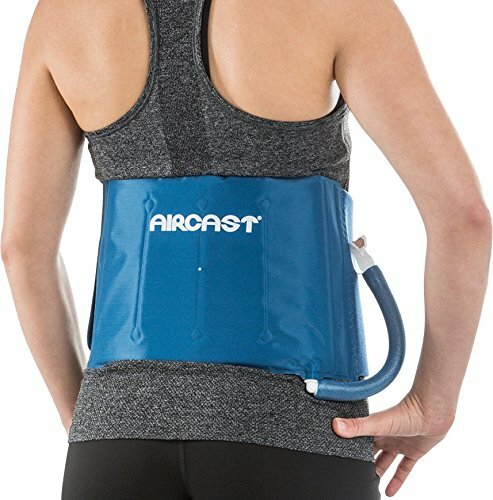 The Aircast Back/Hip/Rib Cryo/Cuff with Gravity Cooler is an integrated approach to cold therapy that combines cold and focal compression delivered using a non-motorized, gravity-fed system. It delivers chilled water directly into a Cryo/Cuff that is anatomically designed to provide maximum cryotherapy, eliminating the risk of tissue damage. The Gravity Cooler holds water and ice needed to provide 6 to 8 hours of cryotherapy, and is compatible with all Cryo/Cuff and Arctic Flow pads. It's ideal for minimizing hemarthrosis, swelling, managing pain, post-operative recovery, trauma, rehabilitation and sports injuries. The Gravity Cooler includes tube assembly, plastic fittings and an insulation disk. The user manual provides easy to follow directions for use. 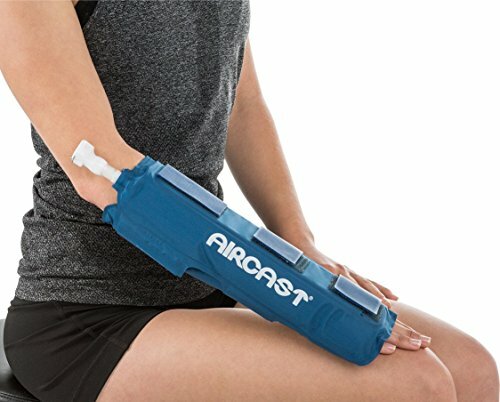 The Aircast Hand/Wrist Cryo/Cuff is an integrated approach to cold therapy that combines cold and focal compression delivered using a non-motorized, gravity-fed system. Used in conjunction with the Aircast Cryo/Cuff Gravity Cooler (sold separately), it delivers chilled water directly into the anatomically designed Cryo/Cuff to provide maximum cryotherapy, eliminating the risk of tissue damage. The Gravity Cooler holds water and ice needed to provide 6 to 8 hours of cryotherapy, and is compatible with all Cryo/Cuff and Arctic Flow pads. It's ideal for minimizing hemarthrosis, swelling, managing pain, post-operative recovery, trauma, rehabilitation and sports injuries. Universal fit allows the Aircast Hand/Wrist Cryo/Cuff to be worn on either the left or the right arm. Copyright © Wholesalion.com 2019 - The Best Prices On Cryo Cuff Cooler Online.